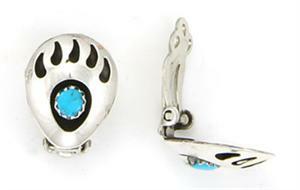 Sterling shadowbox small, aka:standard size bear paw earrings with a free form turquoise stone. They measure approximately 11/16" long by 9/16" wide. Crafted by Navajo artisan Gaynell Parker.